December 5, 2018 (Investorideas.com Newswire) Ron Struthers profiles a small-cap customer experience management firm that counts lots of Fortune 500 companies among its customer base. We are in the third wave of major change with consumer retail markets and with that comes new ways to improve service and customer satisfaction. We have come from brick and mortar to online shopping to mobile shopping. Consumers are now using their mobile device while they shop to look for comparisons, reviews, deals, etc. Businesses need new ways to engage their customers and measure the effectiveness of their products, services and overall experiences. I have talked before about Customer Relationship Management (CRM) and another important aspect to this is Customer Experience Management (CEM). CEM is the practice of designing and reacting to customer interactions to meet or exceed customer expectations and, thus, increase customer satisfaction, loyalty and advocacy. This must be a big focus by all businesses, large and small. If the CEM industry is a new concept for you, this graphic may help you better understand it. 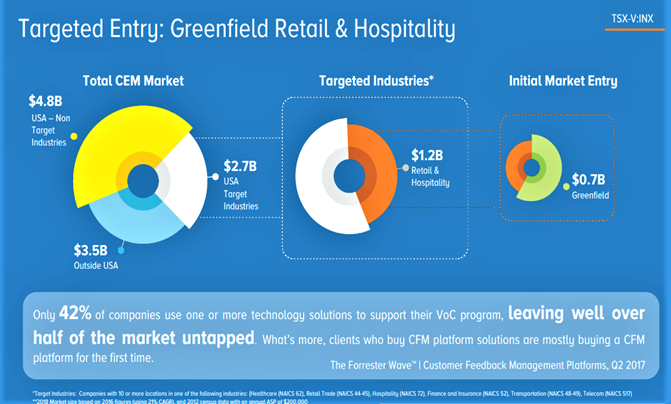 With all the change in retail and service markets in the past two decades, over half the market for CEM is untapped. This means a lot of business will need solutions, but even considering this, the market is currently estimated to be about US$11 billion with very strong growth ahead. The global customer experience management market size is expected to reach US$32.49 billion by 2025, according to a new report by Grand View Research, Inc., progressing at a CAGR of 22.9% during the forecast period. Growing focus of business organizations on retaining their customers by providing consistent and enhanced customer experience across multiple channels is one of the key trends stimulating market growth. Key players that dominated the market in 2016 include IBM Corporation, Oracle Corporation, Adobe Systems, Nokia Networks and Avaya. SAP out of Europe has now joined these ranks. 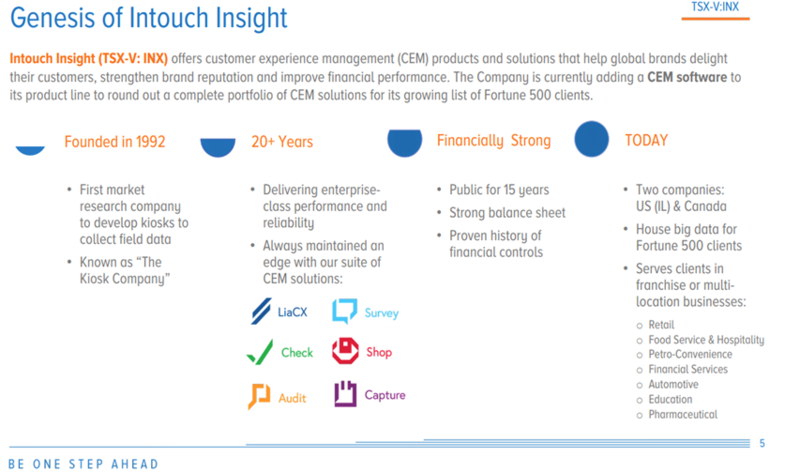 For these companies CEM is just a small part of their overall portfolios. Companies that have a focus in this sector are growing fast and have very high valuations. The biggest challenge for investors is to find an appropriately priced company in the sector that is public as most are private companies and appear to get gobbled up quickly by the big fish in the sea. Private company Qualtrics was valued at US$2.5 billion in April 2017 when it did a US$180 million financing. The company expected to generate revenue of US$250 million in 2017 so that was a value of 10 times revenue. The company was planning an IPO, but this month it was bought out at much higher levels; SAP purchased Qualtrics for US$8 billion so a value of more like 22 times 2018 revenue. SurveyMonkey NASDAQ:SVMK just went public in September. At $12.70 per share the market cap is $1.65 billion. Its annual revenue is around $215 million, which means it is trading at almost 8 times revenue. Rather than pay such high prices, I have found a hidden gem on the Canadian market that is way undervalued. It does most of its business in the U.S. but a good chunk in Canada too. With the way this company is progressing, it is only a matter of time before it is gobbled up too. Intouch develops managed mobile software applications and software-as-a-service (SaaS) platforms, and delivers services for private businesses, governments and regulators. These stakeholders need mobile, real-time information about leads, customer feedback, operational compliance, employee feedback and new product analysis. 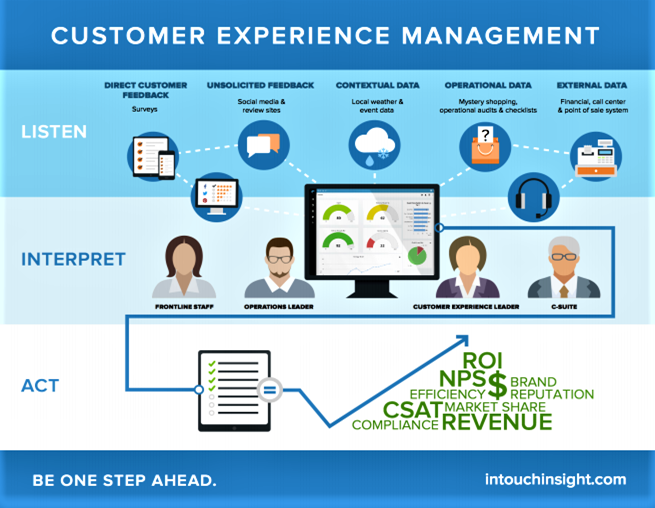 Intouch has developed comprehensive software platforms including IntouchCheck®, IntouchSurvey®, IntouchCapture®, and most recently a customer experience management platform, LiaCX™. These products facilitate the rapid development of data collection programs including event lead capture, customer satisfaction surveys, and mobile forms, checklists and audits, and event lead capture. All products include real-time, online reporting and advanced analytics to help clients focus their time on the most strategic projects. In 2018, recognized in Ottawa as Kanata North Company of the Year. Insiders buying stock, over 1.4 million shares in 2018. The CEM market is about $11 billion and Intouch is targeting Retail and Hospitality, a $1.2 billion segment of that in Canada and the U.S.
Cameron Watt - Director, President & CEO is an experienced leader (held management positions with Excite@Home, PepsiCo, Mars and Unilever). He has owned, operated and successfully exited several small businesses. Bachelor of Commerce from UofA, and an MBA from Ivey. Michael Gaffney - Executive Chairman has 30 years of experience with technology companies. Chairman and CEO, LeoNovus Inc. and former VP of Newbridge Networks Inc. He founded Worknet Inc., Learnsoft Inc., Lansbridge University, Kleer Semiconductor, Soltoro Inc.
Eric Beutel - Director has 20+ years of experience in the investment industry. He has been VP of Oakwest Corporation Ltd since 2003 and director, Equitable Group Inc. and various other private and publicly traded companies. William "David" Oliver – Director has 35+ years of experience in financing, constructions and development within the hospitality industry. Lead asset management and project management group of 360 Vox/Dundee 360 Real Estate Group - $2B+ of 5000+ luxury rooms of Fairmont and Hilton assets. He was former CEO, London Convention Center and had major development roles with ITT Sheraton, Starwood Hotels and Resorts, Wyndham Hotels and Carlson Hotels and Resorts. Involved in developing over 400 hotels globally. Rainer Paduch – Director has 30 years of experience in internet operations, software design, telecommunications and data networking. He was founder, Band of Scoundrels Investment Partnership and Co-Founder of Ottawa Angel Alliance. Also former Founder, President, CTO and Vice Chair of iSTAR. In late Q2 this year Intouch launched a new product, LiaCX™. The product cycle is between 6 and 12 months so it will have a much larger impact on 2019 revenues. LiaCX™ is a proprietary cloud-based software solution built on modern technology designed to handle big data. The software is a complete experience platform with robust capabilities. It collects and combines data in real-time from sources such as customer, employee, brand and product surveys, operational data (financial, point of sale), social media, call centers, IoT, mobile checklists, mystery shopping, and operational audits. It also rapidly integrates data from third-party systems like Salesforce, Oracle and SAP. All data is mapped to the customer journey and artificial intelligence-powered dashboards that transform the data into meaningful customer experience (CX) insights. IntouchCheck is a powerful mobile application that helps organizations easily measure their operational standards internally and implement changes to drive lasting business improvements. The software allows businesses to create unlimited mobile forms and checklists to easily collect and aggregate data from all locations. Key product features include the ability to add photos and signatures to forms and issue management automation. The issue management functionality allows users to flag issues, automatically alert key stakeholders, assign issues and set due dates, and track issues through to resolution. IntouchCheck also includes real-time reporting on performance and the ability to view performance by location, region, date and more. IntouchSurvey is a software application that allows businesses to perform web-based surveys to collect feedback and view results using robust, real-time dashboards. The most common application of this product is as a customer satisfaction survey tool. IntouchSurvey has an easy-to-use drag and drop survey builder, offers a wide range of question types, and includes more complex functionality like skip logic and conditional questions. The software also includes case management functionality, which allows key stakeholders to automatically be alerted of a low survey score or negative response to a specific question. The case can be assigned to another employee with a due date, and the stakeholder can view the outcome of the case. IntouchCapture is a software application that provides event marketing solutions including analytics, logistics and support. With thousands of event days and millions of customer interactions every year, IntouchCapture is used by Fortune 1000 brands, agencies, government and military across North America. The company’s complete software stack, stocked hardware warehouse and technical engineers bring big data, analytics, mobile-first design and data collection expertise to our customers. Intouch's product suite and business is summed up nicely on this slide from its presentation. Intouch is in good financial shape. Last financial reports reveals $0.9 million in cash with $6.0 million in assets. Long-term debt is very small at $28,197. 2017 revenue was $13.9 million, with roughly a U.S. 60%, Canada 40% mix. Revenue for 9 months 2018 just announced was $11.3 million. The annual revenue run rate is about $15 million. The company is currently running small losses as it invests in advance of new product revenues. Late in 2017 Intouch closed two private placements for $3 million and $520,000 by way of non-brokered private placements for six million units at a price of 50 cents per unit and one million units of the company at a price of 52 cents per unit. This is a rare opportunity to buy a solid tech company with strong projected growth in 2019 and at a ridiculously undervalued price. Intouch is well positioned in a growing market with a solid customer base. This, with its revenue model means very little downside risk but lots of upside. The risk/reward on this is very attractive. Based on two recent public transactions, companies in this space see very high valuations. Intouch revenues come through recurring revenue from traditional product lines (IntouchShop/IntouchAudit) as well as its newer SaaS based product lines (IntouchSurvey/IntouchCheck/IntouchCapture). Having this strong, stable base of revenue positions Intouch well for future growth with the launch of LiaCX in mid-2018. Since the sales cycle around CEM software is expected to be about 6-12 months and Intouch launched the product in May, significant revenue from the new platform is expected in 2019. Intouch is offering an upgrade of its product to current clients to help boost sales. Its client list includes many Fortune 500 companies and companies like FedEx, Mac's, Beer Store, ABC Fine Wine Spirits, Sobeys, United Pacific, Equifax, General Motors, Orange Theory Fitness, A&W, etc. There are a number of private companies we can compare Intouch with and two public transactions that highlight the strong potential and bargain with the stock. Intouch is approaching the revenue number of private companies ResponseTek an Clarabridge, which are making revenues in the $30 and $40 million range. Medallia and MatrixCX have revenues over $200 million. There is no reason why Intouch cannot reach these revenue numbers in a few years. The valuations are very high in this sector as it is perceived to be a new and upcoming sector. Qualtrics was valued at US$2.5 billion in April 2017 when it did a US$180 million financing. The company expected to generate revenue of US$250 million in 2017 so that was a value of 10 times revenue. However, this month it was bought out at much higher levels, US$8 billion by SAP so a valued more like 20 times revenue. SurveyMonkey NASDAQ:SVMK just went public in September. At $12.70 per share the market cap is $1.65 billion. Its annual revenue is around $215 million so is trading at almost 8 times revenue. With a current market cap of only $9 million, the stock is trading at just 0.6 times annual revenue. There is no reason that Intouch cannot be trading at 5 times revenue, which is over $3 per share. At 10 times we are looking at $6 per share and this is on the 2018 revenue run rate. The only reason the stock is so cheap is because it is not on the radar of many investors at this point in time and recent overall market weakness did not help. The stock drifted down from its highs in latRon Struthers profiles a small-cap customer experience management firm that counts lots of Fortune 500 companies among its customer base.e 2017 and has built a solid base in the $0.42 to $0.50 range since April. The $0.40 area is long term support and other than a very brief dip in April, you could not buy this stock cheaper back in mid-2016. Near-term resistance would be in the $0.50 to $0.55 range and after that the highs around $0.90. The recent dip, no doubt temporary tax loss selling. Insiders have been loading up on the stock—so should we. Over 300k shares in October and over 1.4 million bought by insiders in 2018 thus far. Intouch Insight is a paid advertiser at playstocks.net and I currently own 28,000 shares. 1) Ron Struthers: I, or members of my immediate household or family, own shares of the following companies mentioned in this article: Intouch Insights. I personally am, or members of my immediate household or family are, paid by the following companies mentioned in this article: None. My company currently has a financial relationship with the following companies mentioned in this article: Intouch Insights is an advertiser on Playstocks.net. Additional disclosures below. I determined which companies would be included in this article based on my research and understanding of the sector.